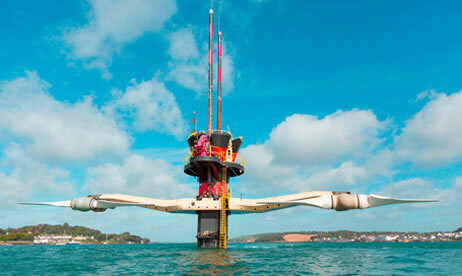 (Nanowerk News) Siemens continues to develop its technology for tidal stream power plants. In the future, the new model will deliver higher performance at lower costs due to optimized construction. Today, the SeaGen power plant in a northern Irish narrows has an installed capacity of 1.2 megawatts (MW). The SeaGen-S will deliver two MW. The Welsh government has now approved the construction of five of these turbines for a ten MW power plant off the northwestern coast of Wales. It is scheduled to go into service in 2015 and supply around 10,000 homes with environmentally friendly electricity. The new rotors are the most apparent change in construction. Their diameter has been increased to 20 meters and each of them has been equipped with an additional rotor blade. That means that the new model looks somewhat like an underwater windmill. The Siemens experts promise that the new rotors will be better able to distribute the pressure of the water current. This in turn will reduce wear and lengthen the service life of the power plant. A black and red steel tower rises above the water in the 150-square-meter Strangford Lough in County Down, Northern Ireland. It is part of the world's first commercial marine current power plant. The SeaGen facility has been in operation since November 2008. Not far from the small coastal town of Strangford the facility equipped with two 600-kW turbines supplies ecofriendly power to over 1500 households. The company wants to build more power plants using the SeaGen-S in underwater arrays similar to the one in Wales. In that way, large amounts of electricity could be brought together - as is the case with wind farms - and transmitted to the mainland. The construction of arrays also makes sense when the topological requirements for tidal stream power plants are taken into consideration. By contrast to tidal barrage power plants, tidal stream units don't require a dam. But that means that these power plants won't work just anywhere - they should only be constructed in locations with especially strong currents. SeaGen is located at just such place, the narrows between the natural harbor of Strangford Lough and the Irish Sea. Here the water flows at a constant speed of more than 4.7 knots - corresponding to 2.4 meters per second. Driven by this current the rotors of the power plant turn ten to 15 times per minute. The 1.2 megawatts generated by SeaGen supplies electricity to around 1,500 households. In October 2012 SeaGen reached three significant milestones for commercial power generation. The facility has now generated 22.53 megawatt hours of electricity in one day, one gigawatt hour in 68 days, and a total of six gigawatt hours since the middle of 2008. With these achievements, the technology has taken an important step toward commercialization and market maturity. For the development of the SeaGen-S, engineers have turned to the data that has been collected during the SeaGen's 25,000 operating hours to date.